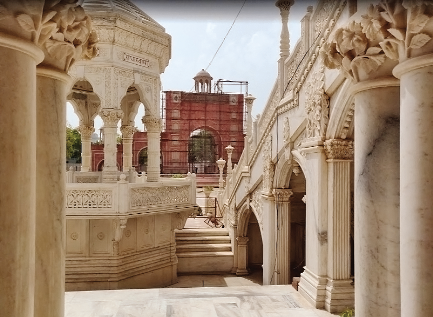 The building of the Radhasoami Temple is what can only be called a creation by dedication. Stone cutters have been labouring for more than a hundred years on the building of this unique structure, which appears to be finally nearing completion. Generations of stone cutters and their families have been working on an edifice which when completed, will certainly be one of the more important monuments in a city, already over full of unique structures, including the inimitable Taj Mahal. The main structure of the building is over a hundred square feet in size, and has a wide colonnaded-verandah running on all four sides. The design encompasses architectural features of different classical styles, in keeping with the secular traditions of the Radhasoami Sect - which makes no distinction of caste or creed, and accepts all into its fold. Clearly recognizable in the design of the temple, are aspects of Jain, Muslim, Hindu and Christian architecture, brought together in a manner that is as spectacular as it is unique. Arches in different shapes and columns of different styles, blend harmoniously to create an architectural wonder that once completed, may well become as much of a draw in the city as the Taj Mahal. The columns and arches embellished with carved fruit and flowers, are created with an eye to detail seldom seen in buildings of this day and age. Clusters of fruit and flowers impeccably carved out of white marble, positioned high up on marble columns, have trailing creepers and leaves, falling naturally over arches—each leaf perfect to the last curve. In these carvings, not only is the workmanship of the stone carver exceptional but also the skill in superimposing the carved tendrils from the columns, over the arches are like trailing vines on a wall. Besides white marble, other shades of marble—green, pink, and black—have also been used in the building of the temple. The different colours, add variety and highlight some of the intricate carving on arches and pillars. The famous 'pietra dura' work of Agra has been extensively used in the building of the structure, while the walls have intricate inlay work in floral designs, and text highlighting the teachings of the Radhasoami Guru. The Samadhi of Guru Swami Shivdayal Singh, is in the basement, 20 feet below the main hall. A dome in white marble has been created directly above it on the upper floor. Work on the temple is now almost complete and it is expected to be ready by December 2018. The creation of this edifice has involved the work of 4 or even more generations of marble carvers employed in the construction work – automatically taking over and continuing the work of their forefathers. Workers on the site are thus of all age groups and many have been trained in their skills from their fathers, on this very site. The common bond that holds them together is ‘their devotion to the faith’ and for all those who have toiled in creating this masterpiece, it has been and continues to be, ‘a labour of love’. The work is funded by donations from the followers of the Radhasoami faith. Funds trickle in slowly and the work goes on in a never-ending manner. All those involved, believe that purification of the soul comes with service. So though the Radhasoami Temple is near completion, the followers of the faith will no doubt continue to find ways of practicing their selfless service. Soamibagh created with such love and devotion is a living example of the quality of craftsmanship that still exists in today's India. A creativity that has been honed to perfection by centuries of traditional skills passed down from father to son, since time immemorial. For even in its unfinished stage, the Radhasoami Temple is spectacular and visitors always marvel at the intricate designs and delicate shapes that are being created by the gnarled hands of the workers. The city of Agra may be considered twice-blessed, firstly because it is the home of the Taj Mahal and embodies the immortal love of an Emperor for his Queen. Soami Bagh offers the second reason and highlights the selfless love of millions of servers, who has been inspired to create such a magnificent monument to immortalise their Guru.